Andrew Johnson is a 26 year-old vegan athlete living in Louisville, Kentucky, USA. He is an engineer, the GM of a very vegan-friendly juice and smoothie bar called LIFEbar, Secretary and Treasurer of the Louisville Vegetarian Initiative, and a new student of the banjo. You can see his recipes and find him on Twitter and Instagram. When I was much younger, my sisters went vegetarian, then vegan, before I knew what that even meant. They never pressured me to change my diet, but told me how to get information if I wanted to know about it. I put it off for years, until finally as a college freshman I dove into it and found the profound sadness in our treatment of other beings. I went vegan, and will stay vegan, because of my compassion for all beings. I have been vegan since thanksgiving of 2007, so almost 6 years. I was vegetarian for just over a year before that. I have never been healthier. My plant-based diet has helped me get and stay in great shape, recover more quickly, and feel better on a day-to-day basis than I had ever felt before. To me, veganism is an entire way of life built around compassion. It starts with the diet, yes, but it soon spreads into every other aspect of your life. My decisions about my clothing, my toiletries, my household supplies, they’re all based on my belief that we as humans have no right to “use” animals for anything. On an average week, I have about 4 work-out days. When it’s a cold Winter in KY, this consists mostly of running 10-15 miles per week, indoor rock climbing 3 days per week, a few yoga sessions, and volleyball. When the weather warms up, I will be increasing my running as well as including biking and swimming for triathlon training. I could probably get away with less than 4 sessions per week, but if I dip below that, I start to feel lazy. I try to get as many friends involved as I can. Especially with long runs, rock climbing, and volleyball, the more people I can get interested the more beneficial. I used to work at the campus gym while in college, and I had friends who would come in for training sessions. I love to help people work on areas they’d like to improve, whether it is endurance, building muscle, or just feeling healthier. All of them. Haha. Right now, I’m very active with running, climbing, yoga, indoor volleyball, and a little basketball. I also love ultimate frisbee, cycling, soccer, and football, so when the weather is good I’ll start back with those. Swimming is a sport I’ve always struggled with, but I’m determined to keep improving. I often hear that veganism isn’t a healthy lifestyle. People will say, “Oh my friend went vegan for 6 months but they got really sick so they started eating meat and dairy again.” It’s difficult to fight ignorance, so I address these situations with information: talking about the health benefits of commonly known vegetables, fruits, and legumes, and stating how keeping a balanced diet of these foods is the key to staying healthy. The protein argument is a huge part of this misconception, but if you ask someone how strong a gorilla is, they’ll catch on pretty quickly. The biggest strength of all, I think, is that no other sentient being needs to suffer for me to succeed. That being said, I think that my plant-based diet helps to keep my body packed with naturally sourced vitamins and minerals, keeping my muscles, blood and bones ready for the exertion I put them through. I rarely get sick, so I don’t miss any time with a cold or the flu. My body also seems to heal more quickly than it used to, so my recovery downtime is shorter. My biggest challenge is eating at the post-event parties. Whether it is a running race, a triathlon, or any other event, the food is generally laden with dairy and/or meat. Granted there is almost always a large portion of oranges, bananas, and similar fruit, but that’s not enough for someone of my size (I’m 6’10”) to curb their hunger after a race. In engineering, it seems to be 50/50. Some people are genuinely interested and made an effort to look for options if we go out to lunch or they bring food to the office, while the others just make jokes. As GM of an organic juice and smoothie bar, though, the majority of people are supportive. Many of my customers are vegan, vegetarian, or trying to increase their plant-based meals, so they are excited to come to a place that is mostly vegan and talk to a vegan behind the counter. My family is extremely supportive, and I am so thankful for that. They are who I got my compassion from, and are all either vegetarian or vegan themselves. Holidays at home are a treat because now it’s the non-vegan dishes that are the oddballs, not the vegan dishes. “How do you do it?” or, “what do you eat?” are the most common questions I hear. I try to tell people that as a vegan I eat a wider variety of foods than I ate as an omnivore. People get set on this idea of a meat and potatoes meal, so they only think about the chicken, potatoes, and (maybe) green beans. They’re missing out on so many wonderful vegetables, grains, legumes, and fruit. I tell them that going vegan opened my eyes to new foods, and encourage them to try it out for themselves. 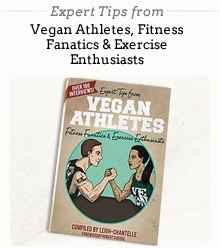 Seeing other vegan athletes succeed in their fields is always a great motivation. Mostly, though, I find motivation in my family and friends. I’m lucky enough to know so many talented individuals, and when they share their passion for their sport with me, I get hooked and motivated to find my own passions. I suppose that is why I participate in and enjoy so many; I find love for sports extremely contagious. I’m also motivated by my own progress. Seeing myself improve at something I enjoy is richly rewarding. Breakfast - more often than not, is a veggie smoothie with spinach, kale, avocado, cucumber, apple, banana, ginger root, lemon, cinnamon and cayenne, mixed with ice, water, and some almond milk. Lunch - generally a huge meal I make from scratch on Sunday and eat throughout the week. I love spinach lasagna, black bean empanadas, asparagus quiche, soup and bread – basically, what most people eat for dinner. Dinner - I tend to work out at night, so when I get home my dinner consists of a big protein shake and small snacks. The protein shake is generally frozen banana, an apple, oatmeal, cannellini beans, protein powder, peanut or almond butter, and cinnamon, mixed with ice, water, and almond milk. Snacks (healthy & not-so healthy) - I eat about 6 times a day, so snacks are a necessity. I tend to make a lot of muffins, homemade hummus with veggies or triscuits, banana buckwheat pancakes with peanut or almond butter and agave instead of syrup, couscous salads with plenty of nuts and veggies, and if I have no time to cook a snack myself I’ll grab a Clif bar and a banana. Protein - I like to use a combination of protein-rich foods and protein powders throughout the week. For foods, I like cannellini, black, and mung beans, almonds, and lentils. For powders, I like hemp seed, Vega, Sun Warrior, and PlantFusion. Calcium - I eat a large quantity of leafy greens and beans on a daily basis for my calcium. Iron - I eat a lot of beans, tofu, and spinach. I think my vegetable smoothie in the morning is my greatest energy-boosting meal. I’ll drink one of those (roughly 30 oz.) before work, and I’ll have all the energy I need for hours. Last year I took a B-12 supplement because a friend recommended it, but I honestly did not notice any benefit while taking it. Currently the only supplements I take are protein powders. Gaining muscle - do anything Robert Cheeke says! Eat a healthy, balanced diet, with about 1 to 1.5 grams of protein per pound of bodyweight, and do plenty of weight training. I noticed that when I did a very intense workout 3 times per week, focusing on a different set of muscle groups each session and increased my protein intake to 200 g per day, I had noticeable gains. Losing weight - Stay active. Especially early in the morning, so that you boost your metabolism and it stays high throughout the day. Run often. If you can’t run, jog. If you can’t jog, walk. Never take the elevator or escalator up a few flights; take the stairs. Cut out as much added sugar from your diet as you can. When I stopped drinking soda and store-bought juices at 19, I lost a lot of weight. If you make a few small adjustments, and do these every day, you’ll notice a big change over time. I lost 60 pounds (27 kilograms) by following the suggestions I just mentioned. Maintaining weight - I can’t say this enough: eat a balanced diet. Don’t overload on one type of food, eat plenty of fruits, vegetables, grains, and legumes. These foods are nutrient-dense, so you get full without consuming too many calories. Also, try not to sit for too long. Get up and move around, even if it’s only a short walk down the street. A body at rest will stay at rest, a body in motion will stay in motion. Improving metabolism - I’ve noticed that a quick workout in the morning does a great job at boosting my metabolism. I like to go for a short run or do yoga, but anything that raises your heart rate for 20 minutes or more will work. I also eat a lot of spicy foods like peppers, ginger, and cinnamon, and drink green tea. These are all shown to increase metabolic rate. Toning up - I highly suggest yoga. It’s helped me not only tone my shoulders, obliques, and legs, but also to improve my balance and state of mind. It’s hard to find a practice more beneficial than yoga, in my opinion. As I mentioned before, I manage a meat- and dairy-free juice and smoothie bar, as well as hold two board positions in the Louisville Vegetarian Initiative, which helps to spread awareness of the benefits of a plant-based lifestyle in our community. I’m also an animal rights activist, and take part in peaceful protests against Yum! Brands (headquartered here in Kentucky), McDonalds, leather and fur stores, and other businesses that promote abuse against animals. Much of my social media presence is also dedicated to veganism - Twitter, Tumblr, and Instagram. Accounts: Vegan_Giant. The Louisville Vegetarian Initiative has gatherings every few weeks - see our calendar of events. All people, from vegans to omnivores, are encouraged to attend our events. We have potlucks, dining outs, movie screenings, cooking classes, etc. You can also find me behind the bar at LIFEbar here in Louisville, or on social media, and ask me any question you’d like. I’d love to hear from you.